My own personal challenge for 2013. There are a lot of 2013 Challenges going up around the blogging community. I've signed up for a couple. But I thought I would challenge myself to get my physical TBR pile down in 2013. I'm putting myself on notice. For every 10 books I read from the above picture I can buy 1 new release in 2013. That is one HUGE TBR and that's not counting my ebooks and audio books. There is a SMALL pile in the front that are borrowed books. But the rest were bought (new or used) or won through hops and giveaways or gifted. I know you're thinking CRAP that's a lot of books to read in 2013. YES it is. But you are going to want to cheer me on because the books I read will go into giveaways boxes. That's right GIVEAWAY BOXES. I'll do a quarterly update posts to let you guys know how many of the books I've read and with each post there will be a giveaway. While this is not a challenge that I'm hosting for people to sign up for; feel free to let me know what books you've read from your TBR in the comments section of each update post. Because I will pick a random commenter to giveaway a book(s) to. So with each update post you have two chances of winning books off my TBR. Keep in mind some of the books are used so there will be some shelf wear to them. But I only buy used books that are in good condition. I will also be updating this list as I read the books on my Challenges page if you care to stop by to check it out between the quarterly update posts. Good luck with your challenge. I know you can do it! Thanks. I hope I can. LOL. That kind of thinking is what got that many books on my shelf. You don't even what to know how many books are on my Nook. This is a big goal for myself next year also! What were the other TBR challenges you joined? And the Audio book challenge I'm co-hosting. 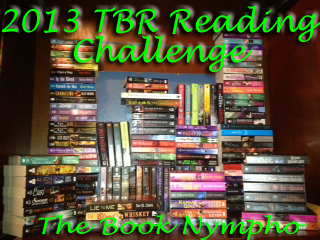 Plus I'll sign up for UTC's Immortal Reading Challenge once their 2013 post goes up. If my TBR are paperbacks it'll look something like this if not worse. Glad my Kindle hides my problem LOL. Good Luck Jen! Holy crap! Seriously my tbr books that I own are no where near this. I'm about to check though. I'm going to pull them off the shelf just so I can see. My kindle only has like 250 books and I think I've read most of them. But now I'm curious. yeah. I bought a lot of paperbacks this year. B&N had that $3.95 sale back in the spring and I had a $50 gift card leftover from Xmas that I used. Then I've been hitting up my local used book store. Then I've won a few and then received some in the mail from Awesome peeps like you and Heather over at Book Savvy Babe. That's a ton of books, but I know you can do it! Good luck! And I'm pretty excited about your giveaways! Anyway, I love this idea. It's a great reward system. It's going to be hard to say no to some of the new releases but I think you can pull this off. Good luck on your challenge. Can't wait to see the results. If it works for you I might try it myself. Wow, that's a pretty good looking TBR pile. I try to read from mine but I can't help all the news ones that I keep hearing about and really want to read. I like the challenge because it's realistic and do-able. I read based on my mood so whatever is on my TBR pile has to be a book I want to read at that moment. Recently I read Angels Fall by Nora Roberts, Firelight by Kristen Callihan and Black Ice by Anne Stuart. It makes me happy because these were books that were on my list for forever! I so need to a challenge like this one! Good luck!